A required course for master's students, the Integrated Policy Exercise is a three-day simulation that takes place during the first week of January. The exercise is highly interactive and allows students to immerse themselves in a timely policy issue, demonstrating their understanding of the policy-making process while interacting with real policy experts. 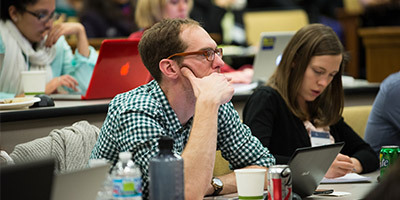 Each year, all first-year master's students participate in a three-day simulation known as the Integrated Policy Exercise (IPE), which tests their ability to make sound, responsible decisions under "real-world" time constraints and pressures. The annual IPE alternates between issues of domestic and international significance, and recent topics have included freshwater resource allocation, regional transportation, immigration policy, an Iranian nuclear crisis, and more. The faculty leader of the Integrated Policy Exercise divides students into teams representing different constituencies with an interest in the problem at hand. Working in small groups, each student team is tasked with representing a particular viewpoint, such as a lobbying organization, an elected politician, a professional organization, or an advocacy group. In consultation with real-world experts on the topic, groups spend the week developing policy positions and political strategies to achieve their clients' objectives. The week culminates in a simulated negotiation process involving all groups, with feedback from outside experts. 2016: Leveraging Southeast Michigan’s Economic Potential through REEGA:The Regional Equitable Economic Growth Authority. Led by Liz Gerber. 2015: Bolstering Detroit's Economic Renewal through Skilled Workers: Implementing Governor Snyder's Visa Plan. Led by Liz Gerber. 2014: Great Lakes Water Diversion: Policy and Precedent for the Great Lakes Compact Council. Led by Liz Gerber. 2013: A Regional Transportation Authority for Metropolitan Detroit: Transportation options for the Future. Led by Liz Gerber. 2012: U.S.-Mexico Border Policy. Led by Ann Lin. 2011: Crisis in Iran. Led by John Ciorciari. 2010: Comprehensive Immigration Legislation. Led by Ann Lin. 2009: Global Climate Change Policy: Post Kyoto Protocol Negotiations. Led by Marina Whitman. 2008: Insuring Michigan’s Uninsured: Options for Expanding Access to Affordable Health Care. Led by Liz Gerber. 2007: Special Meeting of the International Community on Reform of the International Monetary Fund and World Bank. Led by Jan Svejnar. 2006: The Detroit River International Border Crossing: Transportation Infrastructure Options for the Future. Led by Liz Gerber. 2005: Small Arms Forum. Led by Susan Waltz. 2004: Regional Solutions to Urban Revitalization Led by Liz Gerber. 2003: AIDS Global Forum. Led by Marina Whitman. The IPE is a one-credit course required for all master's students. All first-year master's students (MPP and MPA) are required to register for and participate in all scheduled activities of PubPol 638: The Integrated Policy Exercise (IPE). Second-year students are encouraged to register for and participate in the Integrated Policy Exercise for a second time, or to register for PubPol 778: Project Skills Workshop (PSW), a one-credit, half-semester course with modules on selected policy skills such as project management, consulting, reading efficiency, and geographic information systems. Dual-degree students are required to participate in two Integrated Policy Exercises, or in one Integrated Policy Exercise and one Project Skills Workshop.